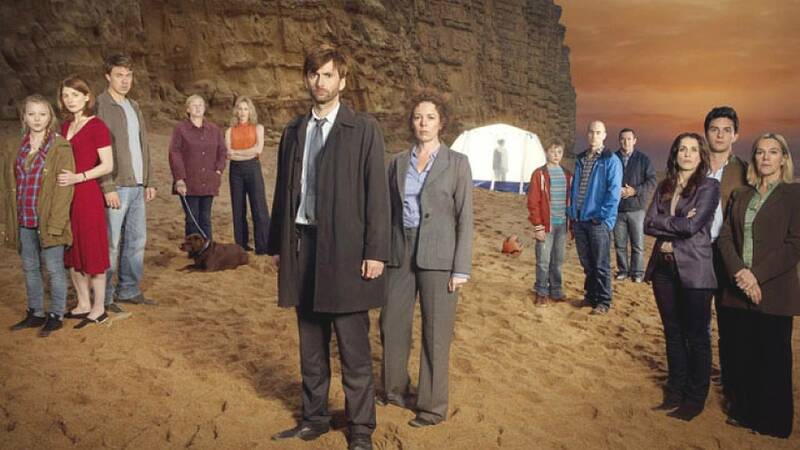 Broadchurch is a TV drama filmed mainly in West Bay, Dorset (coastal scenes) and Clevedon near Bristol (street scenes). The cast includes David Tennant, Olivia Colman, Andrew Buchan, Jodie Whittaker, Vicky McClure, Pauline Quirke and Arthur Darvill. The Broadchurch name was derived from a combination of the West Dorset villages of Broadoak and Whitchurch Canonicorum. A small community in Dorset suddenly becomes the focus of a police investigation, following the tragic and mysterious death of an eleven year old boy. Danny Latimer (Oskar McNamara) has been found dead on an idyllic beach surrounded by rocks and a jutting cliff face from where he may have fallen. 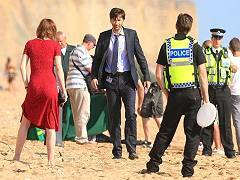 The picturesque seaside town of Broadchurch becomes the heart of a major police investigation and national media frenzy. The sadness of losing a child consumes the family, Beth and Mark Latimer (Andrew Buchan and Jodie Whittaker), their fifteen year old daughter Chloe (Charlotte Beaumont) and Beth’s mum Liz (Susan Brown) as they attempt to cope with their grief. 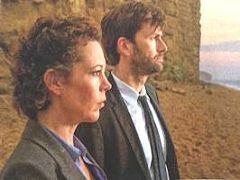 Recently promoted Detective Inspector Alec Hardy (David Tennant) takes the job that local girl Detective Sergeant Ellie Miller (Olivia Colman) believes should have been hers. The community of Broadchurch are slowly drawn into the police enquiry. Susan Wright (Pauline Quirke), a suspicious and scruffy character appears to observe the goings on in Broadchurch from afar. Susan lives in the local caravan park and has a lonely existence. There is a sense she’s hiding something. National newspaper journalist Karen White (Vicky McClure) has come to Broadchurch with a special interest in Detective Inspector Hardy. The village vicar Paul Coates (Arthur Darvill) tries to offer his support, but with the local Broadchurch Echo and national press snooping, everyone is ill at ease. Local Broadchurch business people are implicated as the effects of a death in the community begins to impact on their hard-earned livelihoods. Detective Sergeant Ellie Miller is also emotionally involved with this case. Broadchurch born Ellie has known the dead boy Danny all his young life. How could she not be drawn in? But Hardy’s clinical methods force Ellie to see the community she grew up in through a different prism. Ellie has to find reserves of patience and toughness to negotiate a professional relationship with the difficult and unyielding Hardy. Yet as the drama progresses, Hardy’s own secrets are also laid bare. Broadchurch is an eight part drama, first broadcast on ITV beginning Monday, 4th March 2013. It was written by Chris Chibnall who also wrote Life on Mars, Torchwood, Law & Order UK, Born & Bred and Camelot (TV mini series). At the time of writing Broadchurch, Chris Chibnall lived in Bridport, Dorset.